1. 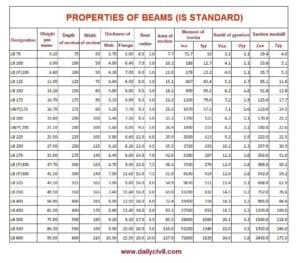 Calculate the loads to be carried by the beam. 2. Calculate the maximum bending moment (M) with regard to the nature of loading condition and span. where f is the safe allowable stress in steel in bending. 4. From the table “properties of beams” select a suitable section having its section modulus slightly greater than the calculated one. In making the selection of the section, deeper section should be preferred. 5. Calculate maximum shear force in the beam. s = intensity of shear stress. S = maximum shear force in the beam. Aȳ = The moment of the area of the part of the section situated beyond its neutral axis. where d is the overall depth of the joist and t is the thickness of the web. 7. Check the selected section for its safety from consideration of allowable deflection. Also Read – Isolated Column footing Design.